Hyphen: In Prime Time features the collaborative work of artist Angela Sriram and her brother George M. Cox II (1943-1968). Angela Sriram enjoys the quietude of walking alone in old cemeteries. She is passionate about reading the dates inscribed just below the name on each stone. She has always been curious about the hyphen between the birthdate and the death date. Sriram says the hyphen between these two dates is the silent gate keeper of our humanity. It is reflective of our talents, hopes, happiness, dreams deferred, character and resolves. For most of us, our hyphen will never be applauded, yet we stay within a framework of our familiar certainties. She asks, “When was the last time you had a date with yourself?” Sriram offers a perspective to this question via the art of a Maryland Institute College of Art graduate. The work of Artist, George M. Cox (1943 -1968), is presented as a metaphor. As a young student of the 1960s, Cox captured the complex texture of the era. 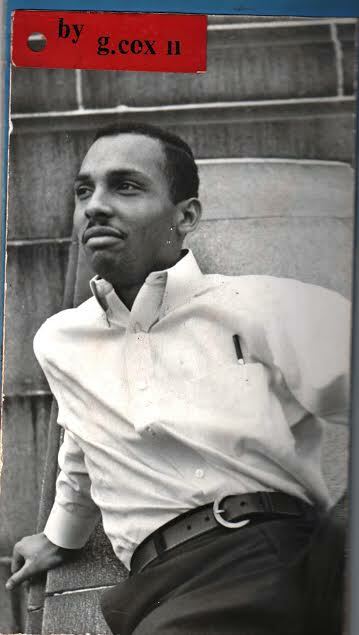 In addition to being a talented artist, George was an activist involved with the Student Non Violent Coordinating Committee (SNCC) and a loving brother. At just 25 years of age, he became one of the first MICA students to make the ultimate sacrifice to our country during the Vietnam War. Arguably, he left us contemporary images to consider 50 years after his death. One of his paintings, titled: Manuscript written with a red moon, has been reinterpreted as jewelry by his sister Angela. The jewelry collection sells at The BMA, Visionary Arts Museum, and The Library of Congress gift shops. For this exhibition his work is hung in different arrangements, offering you the opportunity to view the same images in several different formats. Cox’s work is the defining hyphen of his short life.